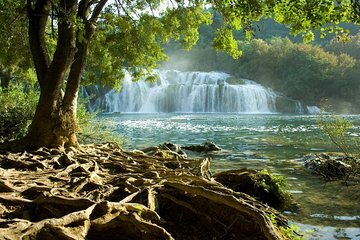 Scopri la bellezza naturale del Parco Nazionale di Krka al tuo ritmo in un tour privato di un'intera giornata da Spalato. Ammira i panorami mentre viaggi attraverso le montagne Dinara, goditi escursioni e osservazione della fauna selvatica lungo il fiume Krka e assaggia il vino croato durante un tour della cantina Bibich (opzionale). A tour customized to you, 5/5! We were picked up from our Airbnb and whisked away in a lovely van (plenty of room for two people) with AC (a must) by our own personal driver. Once at Krka, we enjoyed the park by ourselves for as long as we pleased. Driver was on standby. Safe driving there and back. The company did a great job of customizing the trip. Be sure you get both entrances to Krka. Always check if Bibich Winery is open. They even did a custom trip for me the next day to Omiš. Had a ride down the Cetina River with an older man born there who had wonderful stories!